If you need an MRI scan, read on to learn more about the process. Wide Bore MRI Scans: The “bore” refers to the opening of the MRI scanner. A wide bore system is shorter and wider, which allows for a roomy imaging experience that doesn’t compromise image quality. MRI Scans – High-Field (1.5T): This is the traditional MRI machine, complete with an incredibly powerful magnet (High-Field 1.5T). This scanner is the industry standard and takes about 30 to 60 minutes to complete a scan. MRCP Scans: Magnetic resonance cholangiopancreatography is a specialized MRI focused on obtaining images of the liver, bile ducts, gallbladder, pancreas and pancreatic duct. It’s generally used to diagnose abdominal pain. The entire exam takes about 45 minutes from start to finish. MRI Spectroscopy: This scan identifies tumors and other pathology and may be used to diagnose metabolic disorders. It can also provide additional information about chemicals within the body’s cells. When performed in conjunction with a traditional RMI, it adds about 15 minutes to the total exam time. 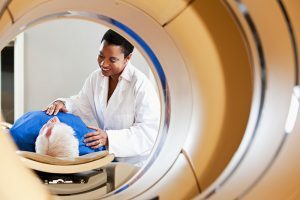 Before your scan, you will fill out a screening form that lets us know if you have anything that could interfere with the imaging procedure or present a health risk. To ensure your safety during the scan, you will be asked to change into medical scrubs (top and pants) or a hospital gown and remove all metallic objects, including jewelry, hearing aids and the like. Be sure to ask your MRI technologist any questions you have ahead of time. MRI examinations usually take about 30 to 60 minutes from start to finish. Your doctor may order your MRI to include contrast, a fluid injected into the vein to make certain details clearer in the images produced. This may cause the exam to take longer. When you enter the MRI suite, you will be asked to lay on the examination table on your back, either head first or feet first depending on the type of scan needed. The table slides into the MRI machine’s opening, and when the scan commences, you will head loud “banging” sounds, as well as the hum of the device. This is all normal. A microphone allows you to speak to your technologist throughout the procedure. However, during the scan, you must remain as still as possible, so the images do not appear blurry. Some patients feel claustrophobic due to the tube-like atmosphere of the scan. However, modern scanners are wider and more open than they were in the past. Our goal is to ease any anxiety and help you feel relaxed during the procedure. You can listen to music or your favorite CD during the exam. If you need to, you can even have a family member in the room. Once your MRI scan is complete, your radiologist will examine the images to ensure no more are required. Then, you can go home. Your physician will receive these images, and you’ll make an appointment with them to go over the results. Health Images has facilities located throughout the Denver and Boulder areas. To make an appointment, browse our list of imaging centers to find the one closest to you. We look forward to hearing from you and answering any questions you may have.